In the harbour in the historic village of Malpeque in Prince Edward Island you can rent lobster traps to catch some lobsters for some delicious meals. 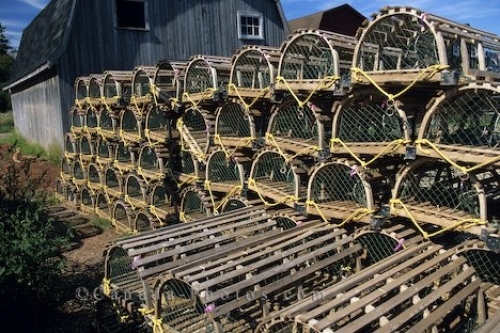 These wooden framed traps enclosed by rope mesh are the most widely used type of lobster traps in Malpeque, Prince Edward Island. Lobster Traps, Harbour, Malpeque, Prince Edward Island, PEI, Canada, North America. Picture of lobster traps along the shore of Malpeque in Prince Edward Island in Canada.